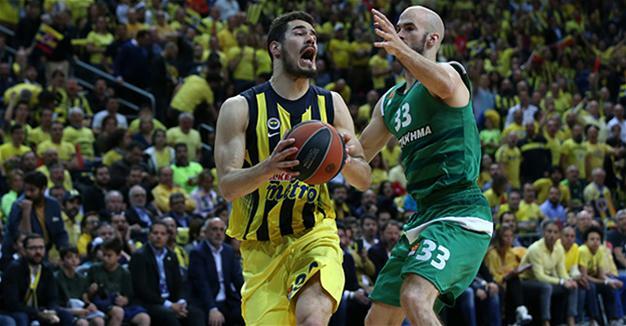 Fenerbahçe became the first team to advance to the 2017 Turkish Airlines Euroleague Final Four, which will be held in its own city, by completing a playoff sweep of Panathinaikos with a 79-61 victory on April 25 at Fenerbahçe Ülker Sports Arena on April 25. Fenerbahçe used a balanced attack to reach its third Final Four in as many seasons. Coach Zeljko Obradovic’s side also became the first team to sweep a series in which it did not have home-court advantage as well as the first to sweep three consecutive playoff series. Bobby Dixon paced the winning side with 13 points, James Nunnally scored 12 and Ekpe Udoh, Luigi Datome, Nikola Kalinic and Bogdan Bogdanovic netted 10 points each. Udoh also collected 10 rebounds, while Jan Vesely anchored the defense with 4 blocked shots. Fenerbahçe outrebounded Panathinaikos 38-22 and held the visiting side to 5-of-24 three-point shooting (20.8%), while making 13 of 27 shots from downtown (48.2%). K.C. Rivers led the Greens with 16 points and Chris Singleton added 12 in defeat. Obradovic, who will be heading into the 16th Final Four of his 22-year coaching career, noted that the two victories in Athens last week made the difference. “We played very good and very tough in Athens,” said the legendary Serbian coach. “We came here to play on our court. I was sure that Panathinaikos would play much better and they did in the first half. In the first half our biggest problem was our turnovers. In the third quarter we played much better and we decided the game,” he added. Obradovic thanked his players and the club fans, while wishing good luck to Panathinakos, which he led to five Euroleague titles, in the Greek league competition. “Thanks to my players for an excellent job, and thanks to the fans for creating an amazing atmosphere. Their support for us is very special,” he said. Fenerbahçe center Udoh has already set his sights on the Final Four, noting that playing in front of own fans will help the team a lot. “We have two more games to win, but we have to continue to get better through the Turkish League,” said the player.